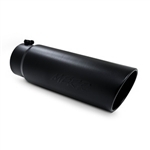 These 5" Black Coated stainless steel exhaust tips are a direct bolt on that install with basic hand tools. These allow you to keep the factory resonators in place to get the look we all want without the annoying drone in the cab from removing resonators. This set of tips has a rolled edge that gives a rugged truck appearance. Comes with 2 tips and reuses the factory clamps. These 5" polished stainless steel exhaust tips are a direct bolt on that install with basic hand tools. These allow you to keep the factory resonators in place to get the look we all want without the annoying drone in the cab from removing resonators. This set of tips has a rolled edge that gives a rugged truck appearance. Features and Benefits: Large Diameter Tips (Weld-On) - Stainless Steel Tips Installed By Professionals. MagnaFlow's Polished Stainless Steel tips will last 5 times longer than chrome tips. These super tough tips will continue to shine for years to come with a Lifetime Warranty against defects. 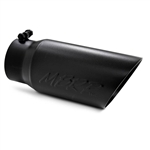 This is a universal exhaust tip that will require modification to bolt on to the 2009-up Ram 1500 trucks. Featuring an embossed BORLA logo, these premium-quality exhaust tips feature mirror-polished high quality austenitic stainless steel, precision welds and distinctive styling.